“Practice makes perfect” is an old adage, and one that musicians in particular are all too familiar with. It’s expected that they’ll spend hours each day rehearsing with their instruments, memorizing pieces, and learning to execute them flawlessly. Physical or muscle memory is helpful, but it shouldn’t be the only tool in a musician’s repertoire. Mental imaging, a technique used very often by athletes, is just as essential for musicians, and can be put to use on a daily basis, to help learn music, master complicated passages, and relax nerves before an audition or performance. Despite the name, mental imaging isn’t solely about picturing something. It’s a multisensory technique that requires you to visualize what you are working on, to hear it, to feel it in your fingertips. Being able to envision success is important, but just as important is the ability to stop, look at where you are making your mistake, to analyze why, and back up and start over, just as you would while rehearsing with your instrument. Let’s take a look at each of these four major applications of mental imaging and how they’ll help make you a better musician. There’s no way to replace good old-fashioned daily practice with your instrument. But you can supplement your physical practices by incorporating mental rehearsals. These can be done anywhere – while riding the bus or a train, in between classes, even before bedtime. Even if you don’t have the time to bring out your instrument, get it ready, and find a space to practice, you can still spend a few minutes going over what you are currently learning, refining your technique, and identify where you are making mistakes. Learning a new piece to play from memory can seem like a daunting process. Everyone has their own study processes and memorization techniques. 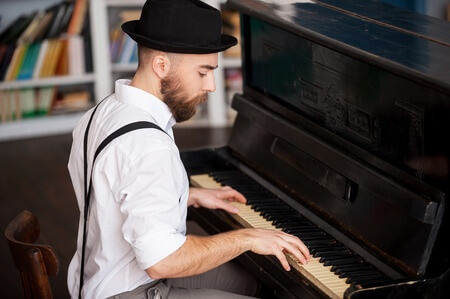 No matter how you learn best, though, you can incorporate mental imagery into your memorization process by rehearsing a piece of music in your head. Test yourself mentally to be sure you know the passage through and through and aren’t relying on muscle memory alone.. As you master sections of the piece, string them together in your head. Remember that one successful run-through is not enough. You should be able to rehearse a passage in your head at least three times before you move on to the next task or section of music. Here’s where the ability to not just visualize, but to analyze, really comes into play. If you find yourself struggling with a piece, add some mental rehearsals to your regular practice routine. Visualize each note, each key, each string. If you make a mistake, rewind. Play through it again. Identify where the mistake is happening. Once you know where, you can focus on why. (Are you struggling to memorize it? Is the passage too fast? Are your fingers fumbling with the movements?) Slow yourself down and work through the problem at a speed you’re comfortable with. If you can break down the individual parts, you’ll understand them better, which will give you a more solid grasp overall. Even if you’ve rehearsed a piece, mastered every technique, memorized the music and performed for all your friends and family dozens of times, an audition or performance can get the best of all of us. Nerves are not something to fear, but they can hold you back, by forcing your muscles to tighten up, or leading you to forget a passage (which is why mental imagery is so important in memorization), and more. Mental imaging can help you overcome your nerves. Picture success in your head. What does a flawless performance sound like? Walk through it, visualizing every note, and moving your fingers accordingly. Mental imaging as a skill will take some practice in its own right to master. But once you do, you’ll find that it is the best way to enrich your own musical studies, giving you the same sort of focus, concentration, and confidence that professionals have. Remember that the key to good visualization is to use as many senses as possible, not just to imagine what you want. Bring the music to life in your mind, and you’ll be able to bring it to life for others.